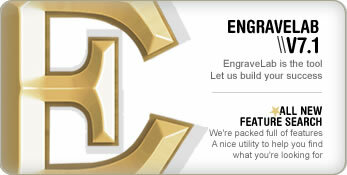 EngraveLab is the number one choice for all engraving needs. Whether you are just starting out, or have been in the industry for years, EngraveLab has the perfect product to fit your needs. Below is a list of the different packages for rotary and laser engraving. EngraveLab Foundation is an entry level Windows based graphics application designed for the trophy and award shop. EngraveLab Foundation includes import / export filters, 1100 fonts (including 100+ engraving fonts), clipart and has drivers for open architecture rotary based engraving machines. EngraveLab Expert is the complete text composition, design, layout and production engraving software. Expert has all the right tools for the trophy and award, recognition, graphics / signmaking professional. Expert includes all the tools in Foundation plus badges / serialization, scan to engrave, complete 2D fill routines and WYSIWYG text compose. EngraveLab Pro includes all the tools in Foundation and Expert plus Dial and Ruler creation, Bar Code support and a Grade 2 Braille translator. EngraveLab Laser is a powerful Windows based graphics application that has the tools to be the one stop laser engraving software solution. These tools are specific to the trophy and award, recognition, graphics / signmaking and industrial marking industries providing the power to be efficient and cost effective. If you are in need of maximum output for high levels of production, EngraveLab Laser provides the tools to achieve that goal. EngraveLab Laser Pro includes all the tools in EngraveLab Laser plus complete 2D fill routines, Grade 2 Braille translator and complete driver support for rotary based engraving systems and vinyl cutters. >> Download Feature Comparision Chart.